The Subterraneans, the only novel of Jack Kerouac's to be adapted to film so far, was released in 1960, when the media fever surrounding the Beat Generation (much of it inspired by the publication of Kerouac's On the Road in 1957) was still at a high pitch. Hollywood took great liberties with Kerouac's story of a romance between his narrator stand-in (Leo Percepied, played by George Peppard) and a young half-black, half-native American bohemian--for starters, the woman was played by the very white Leslie Caron. The soundtrack, however, was composed by Andre Previn, and it features a number of West Coast jazz luminaries--Gerry Mulligan (who also appears in the film as a hip street priest), Art Pepper, Russ Freeman, Shelly Manne, and Red Mitchell. Carmen McRae also appears, singing an updated beatnik version of "Coffee Time." We'll hear both dialogue and music from the film, including some selections only recently released on a new version of the soundtrack from Film Score Monthly. You can listen live Saturday night at 11:05 p.m. (9:05 California time, 12:05 a.m. NYC time) or in the Night Lights archives, where it will be posted Monday afternoon. Ranald Macdougall, the director replacement for the fired brother team of Dennis and Terry Sanders, originally opened the film with the credits rolling over a Pollock/Rothko-like painting that dissolved into Gerry Mulligan playing his saxophone, the light gleaming off his crucifix. This was replaced in the final version by a much more conventional opening showing San Francisco and the Golden Gate Bridge in daytime. The words that appear onscreen were originally almost an exact quote of Allen Ginsberg's description of "the subterraneans" (his character is named Adam Moorad in the book); they were altered in a manner that rendered them more neutral and cliched. The film was originally supposed to be shot in black-and-white for a more austere aesthetic; it ended up being done in Cinemascope and Metrocolor. Next week: American jazz in French new-wave cinema. More notes on the film version of The Subterraneans: the Poet and Painters Mission in the movie, run by the Rev. 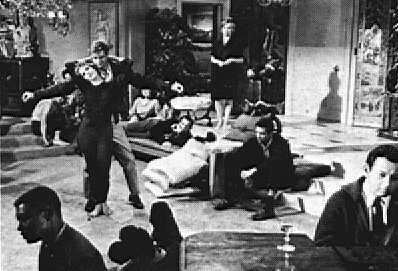 Joshua Hoskins (Gerry Mulligan), was based on a real North Beach place called the Bread and Wine Mission, located at 501 Greenwich Street. Its founder was Pierre Delatre, a writer and a graduate of divinity and comparative religion from the University of Chicago, and his wife Lois. Delattre opened the mission, he said, to serve "a very powerful spiritual movement in America." The movement, Delattre added, was "not in the churches" but "in the streets where a whole group of prophets and singers were energizing and coming together: singers, poets, jazz musicians." In addition to the mission's spaghetti and wine dinners (alluded to in the movie, when Mulligan hands George Peppard a large plate of spaghetti), poetry readings were frequently held, featuring Robert Duncan, Allen Ginsberg, Bob Kaufman, Joanne Kyger, Gary Snyder, Phillip Whalen, and others. The mission also served as the birthplace for the street poetry magazine Beatitude.Delattre advised Subterraneans director Ranald Macdougall, screenwriter Robert Thom, and producer Arthur Freed; he was a model for Gerry Mulligan's Rev. Hoskins character. The "spotlight" scene in which characters stand up and deliver monologues was based on "Blabber Mouth Night" at the Place in San Francisco. These are Subterraneans. The Beat. They are hip without being slick. They are wise without being corny. Most of them are lost. They exist. They are everywhere now. On the Left Bank in Paris. In Soho, London. where the young gather to create and to destroy. I'm indebted to Preston Whaley's book BLOWS LIKE A HORN: BEAT WRITING, JAZZ, STYLE, AND MARKETS IN THE TRANSFORMATION OF U.S. CULTURE for much of the above information. Pretty much! Hard to see it these days... Turner owns it, but I don't believe it's ever been put out on either VHS or DVD. A friend of mine heard me mention it on the radio a year or so ago and loaned me the copy he taped off TNT during a Roddy McDowall festival (McDowall played Yuri, the character based on Gregory Corso); he's now turned it into a choppily edited DVD as well. Whaley argues in his book that the film, despite its many flaws and changes, still serves to uplift beat culture in certain ways... I think he's stretching meself, but the chance to see Mulligan, Art Farmer, and others onscreen is quite cool. It's very different. The characters are retained, to some degree, but Mardou is changed from a half-black, half-Native American to a French woman, and the character of Roxanne--an independent painter sent up as a man-hater who comes around to the conventional view of things in the end--is added. Leo Percepied, the Kerouac stand-in, carries over much of Kerouac's bio, but he's infused with a predilection for violent machismo, and Mardou's spells of mental instability are magnified into onscreen hysteria. (The character in the book is really cool; hard to not come away a bit infatuated with her, and evidently the real-life Mardou--Alene Lee--exercised a similar charm upon not just Kerouac but Gregory Corso, Lucien Carr, and NYC beat man-about-town John Mitchell.) In the book Mardou eventually breaks up with Leo; in the movie she becomes pregnant and they decide to get married. I re-read the book for the first time in 15 years last weekend, and came away surprised by how much I still enjoyed it. Just saw a documentary on TNT about the producer/songwriter Arther Freed. There are several weird connections to GIGI (1958) that I talk about during the program--Freed produced both movies, Leslie Caron starred in both, and Andre Previn, who wrote and performed the score for THE SUBTERRANEANS, was the musical director for GIGI. The program is now archived. Apologies to any who tried to listen yesterday or this morning; there was a problem with the link that has now been corrected. 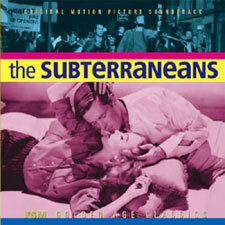 There was a really hip group a few years ago in London called The Subterraneans. They released two tracks Taurus Woman, and a great version of Night in Tunisia, an unknown vibe player was on that date. He is Max Beasley, since made it big in both film and tv, here and in states. I had the privelege once of djingg with him at a great brazillian night, the place was rocking, he was a really nice guy. what made it good also was he was a big, big Cal Tjader fan, so we had plenty to talk about. An esoteric link ? This program will be re-airing this weekend at 11:05 p.m. EST on WFIU and 9 p.m. Central Time on WNIN-Evansville. You can hear it right now, though, as it's already archived. Next week: "Live in London: Sonny Rollins." I'm chasin this film, which I want to see very much. I've got the book. Although I still haven't read it. Book is definitely better than the movie, IMO, but the film's worth seeing if you're a jazz fan and/or interested in how Hollywood portrayed the Beat scene. Great. Then I'll first read the book and maybe later search for the movie.